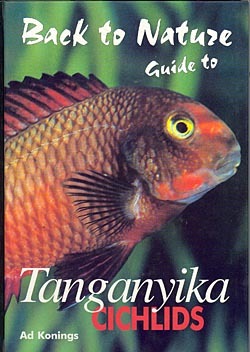 Title: Back to Nature Guide to Tanganyika Cichlids. Chapters: The natural environment; The aquarium (Lighting; Decoration; Plants; The background; The water; Food; Other equipment), The cichlids, Further reading, Index. Species descriptions: More than 175 species. Each species is described with scientific name, synonyms and trade names, distribution, habitat, maximum length, food, breeding behavior, and maintenance. Published in: English, German, Swedish, Danish, Dutch, Italian, Greek and French. There is no other group of aquarium fishes which has evoked such a passion among hobbyists as Tanganyika cichlids have. For many an aquarist they represent a lifelong addiction to keeping, breeding and, most of all, observing these interesting fishes. Why is this? The answer is easy: Tanganyika cichlids are the most interesting aquarium fishes known today. They provide hobbyists with a combination of attractive fishes, interesting behavior, and easy maintenance, with the added benefit that the sale of their offspring can sometimes cover most of the cost of keeping them. This guide provides an overview of the species currently available and some basic information on how to keep them in the most natural way. Ad Konings (El Paso, Texas) is biologist of profession and has more than 30 years of experience with Tanganyika cichlids. As author of more than 15 books on cichlids he specializes in underwater observation and photography of these fishes. He studied biology at the University of Amsterdam and did DNA cloning research at the Erasmus University of Rotterdam. His many expeditions (more than 30) to Africa and Central America gained him a wealth of information on cichlids and their biotopes. 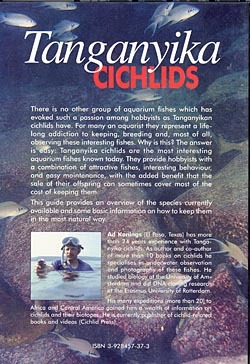 He is currently publisher of cichlid-related books and videos (Cichlid Press).